The Finance, Policy, Operations and Legislation Committee of Fremantle Council last night approved the application by Silverleaf Investments for the potential improvement of the public realm adjacent to the Manning Building in Market Street, but the item needs to be endorsed still by full council since there was no quorum as two members excused themselves due to a conflict of interest. Silverleaf wants to put a new awning along the building but that requires that the city gives up the four 15-minute parking bays plus the loading bay, near the intersection with Bannister Street. Council already granted permission for the developers to use the percentage for the arts money to re-install the veranda along William Street, when the development of the Manning Building, with a tavern and micro-brewery commences. Councillors were reluctant to lose parking bays but also acknowledged that pedestrian safety has been an issue on busy days, especially on weekends. 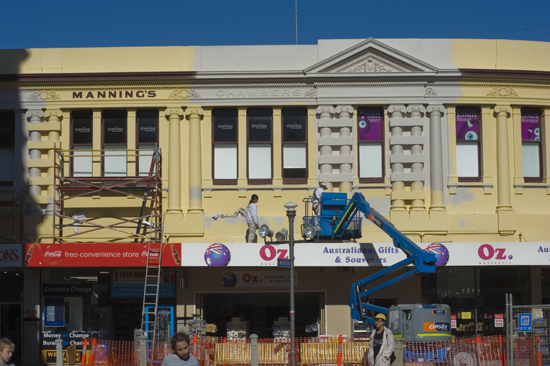 It is really good to see so much building and maintenance projects going on in central Fremantle with the Manning building on the corner of the High Street mall and William Street being the latest to get a new coat of paint to help make the mall more attractive. Freo can do with a bit of a facelift and clean up, so these are positive signs of renewal and rejuvenation.